In the next of our speeches we hear from Terry Riley: Chair of the BDA. In the next in our series of rally speeches we hear from Andy Greene, National Steering Committee member for Disabled People Against the Cuts (DPAC). Apologies to hard of hearing/deafened readers. Transcript to follow soon. After the Work and Pensions Select Committee Inquiry, Stop Changes 2AtW held a rally to hear what key figures were feeling. In the first of our speeches, we hear from Stop Changes 2AtW spokeswoman and Graeae Director, Jenny Sealey. Stop Changes to Access to Work Rally. 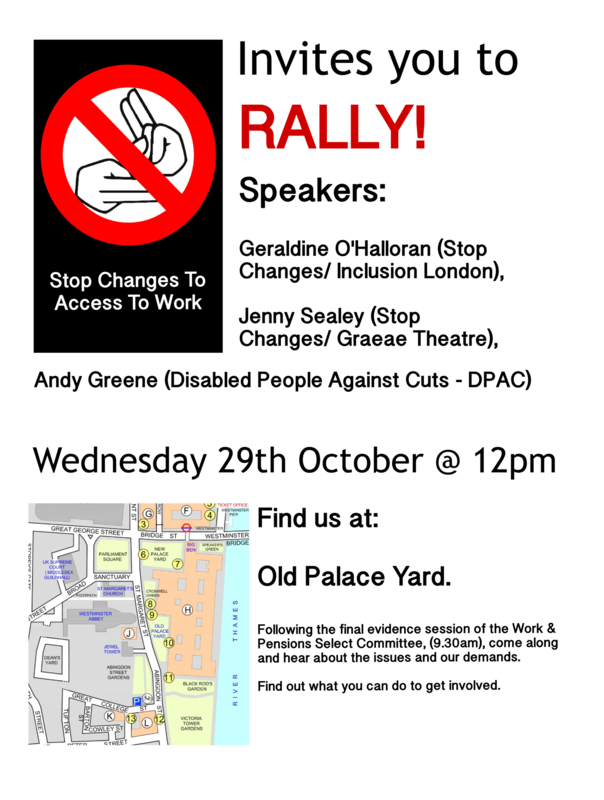 Join us this Wednesday (29th October) at the Old Palace Yard to listen to Stop Changes speakers: Geraldine O’Halloran and Jenny Sealey, and DPAC National Steering Committee member: Andy Greene. We will be meeting at 12pm. Find out what the issues are, our demands and what you can do to get involved. Where has Access to Work’s money gone? We have heard today that as a direct result of Leigh Day sending, on the individuals behalf, a pre action letter for judicial review the DWP have finally re-instated support. However, there were a number of issues with the AtW scheme raised by the deaf individual in their letter that the DWP failed to respond satisfactorily to, such as: a lack of transparency; failure to publish an accessible guidance, internal inconsistency of decisions made and failure to consult on changes to funding. Stop Changes therefore propose to challenge these issues in order to assist the many other deaf people experiencing difficulties. Leigh Day are committed to assisting with a case being brought. “We are deeply concerned that due to recent changes, which we believe were introduced without proper consultation, the Access to Work scheme appears to be in complete disarray. “As a result deaf and hard of hearing Access to Work users, who depend on the support provided to them by the scheme, are having their support arbitrarily cut or suspended, this is putting their employment at serious risk. Stop changes would like to hear from anyone still experiencing problems with AtW who would be interested in taking a case forward. We are in a strong position as we have legal support in place and now, thanks to the generosity of individuals, have a fighting fund established. A message from DeatAtW: “Complain to PHSO”! The PHSO have now accepted several complaints for investigation from Deaf AtW users and interpreters (I know because I’ve been supporting them). This is brilliant news. But more of you need to join them, both to have a wider impact and to sort things out for yourselves (remember the Select Committee). – and have tried but not succeeded in getting a reconsideration and/or complaining, then NOW is the time to complain to the PHSO. Just go to http://www.deafatw.com/phso.html, and use the contact box there, or email me directly. And I’ll send you more detailed guidance for AtW users on if and how you can complain. It’s QUICK and EASY ! Really. Interpreters – if you are OWED MONEY BY AtW, and haven’t been able to sort it out, stop mucking about and complain to the PHSO! Again, contact me and I’ll send you guidance for interpreters on how to complain, what to include etc. and you’ll be up to date with information relevant to you and your customers. Jen Dodds has explained why people should support the fighting fund in an article on Limping Chicken. We’d like to thank her for her support.